Every year millions of migrating songbirds heading from Africa to Europe get blown out of the sky by weird people with shotguns. 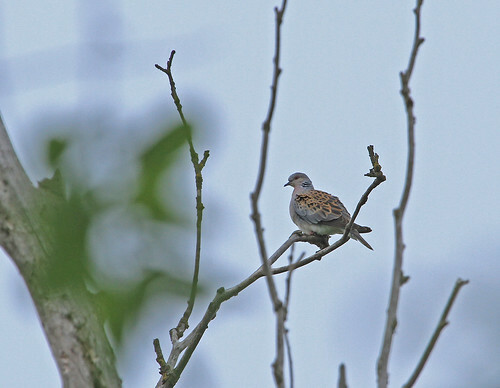 That combined with the policy in the UK of destroying habitat at an alarming rate is making life impossibly possibly difficult for some of our iconic bird species, one of which is the turtle dove (Streptopelia turtur, Dansk: turteldue). 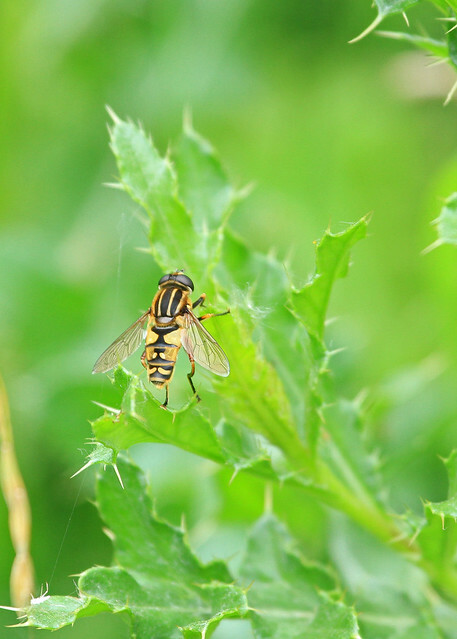 But last summer I was exploring one of my regular haunts, Milton Country Park, on the northern edge of Cambridge, on a warm Saturday morning and the air was buzzing with insects including this handome hoverfly known as the ‘footballer‘ due to its rather fetching black and yellow striped thorax. 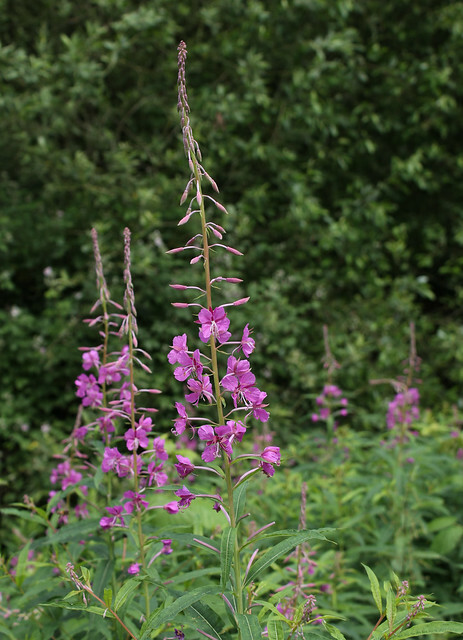 This species is common in England reaching a peak in July which is when I snapped this individual. 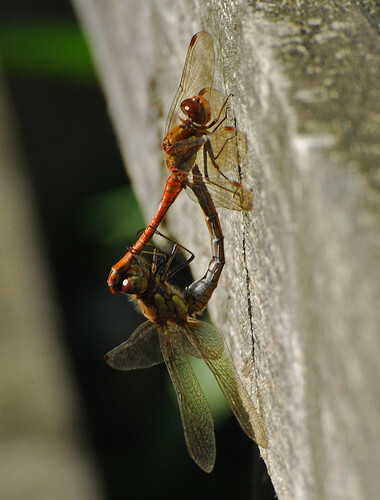 And hoverflies aren’t the only abundant insects to be found in July. 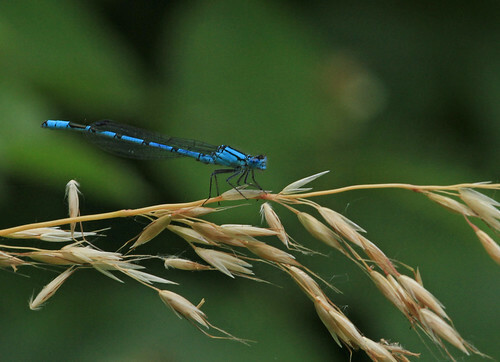 Milton Country Park is also home to mumerous species of Odonata, the dragonflies (Anisoptera) and damselflies (Zygoptera). …and a few other streams and pools, and despite the abundant human presence it remains a haven for some properly exotic wildlife including a bittern that appeared for a week or so last year, and the occasional osprey stopping off on migration from sub-Saharan Africa to breeding sites further north in the UK. 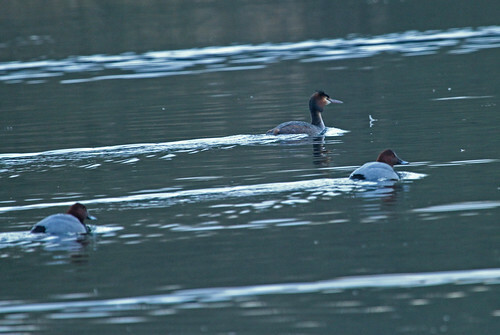 The grebe was almost hunted to extinction because its dense feathers were coveted as a substitute for fur. 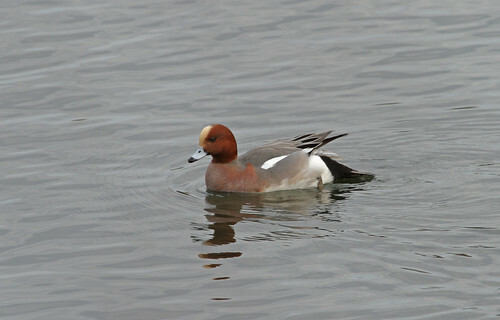 But it has recovered and can now be found on lakes over most of the UK. 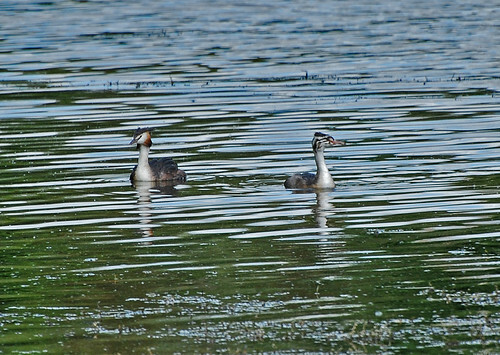 The one above is an adult and the one below still has the striped head markings of a juvenile. The turtle dove is in very serious decline, I believe we have lost around 97% of our breeding population and it is anticipated it will become extinct in the UK by 2020 as it’s also under increasing pressure in Europe. 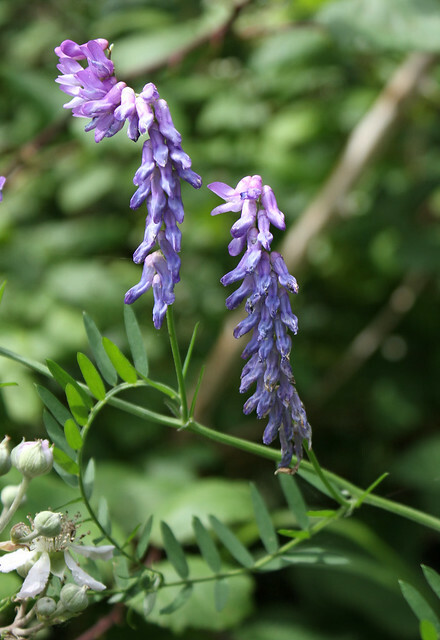 The reason for its catastrophic decline is that it feeds on seeds from cereals and other plants and both of these are a scarce commodity in the fields of the UK at the time the doves need them. 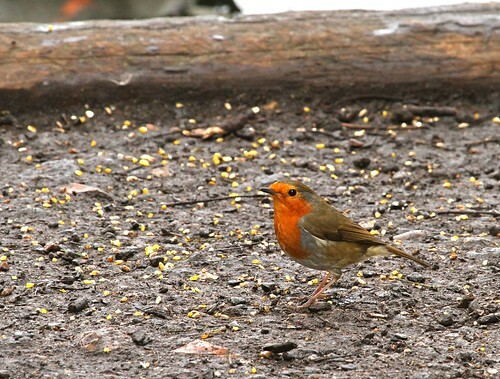 So the birds arrive here in the UK exhausted after a heroic migration across the Sahara and the Mediterranean. And those that avoid the gun-toting imbeciles in southern Europe arrive here to find there’s not enough food. So as it takes them a long time to rest and feed and get back into breeding condition, they only have time for a maximum of one brood per season before they have to head all the way back. And this enforced curtailment of there breeding window means they just can’t sustain their numbers. They arrive back in the UK from around mid April so I’ll try to capture some more photographs before they finally stop coming here all together. 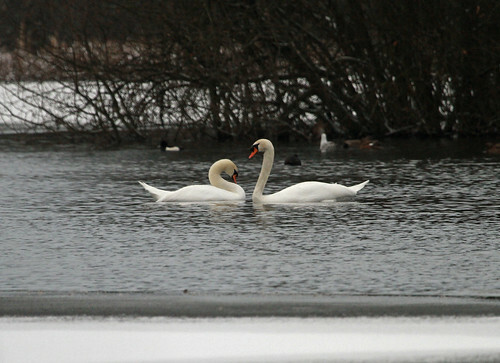 The font of all wisdom in my area for what birdlife is around is the Cambridge Bird Club ‘What’s About‘ blog. 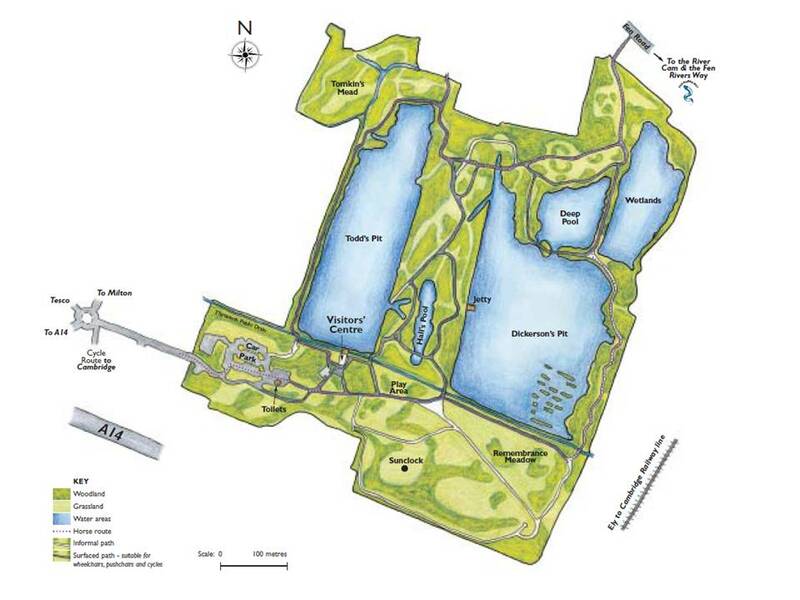 A short while ago there was a report of a sighting of a bittern at one of my regular nature walks, Milton Country Park. This was an exciting development because I’ve never seen a bittern before, so on the following Saturday morning I set off before dawn to be in situ at sun up to try and see it. 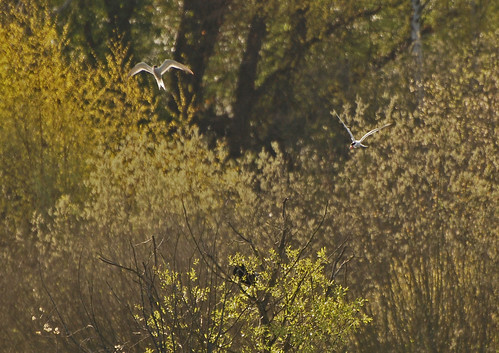 The bittern (Botaurus stellaris, Dansk: Rørdrum) is a small brown heron which lives in reedbeds and is so perfectly camouflaged it is almost impossible to find until it breaks cover. It’s famous for the ‘booming‘ call of the male which can be heard up to 1km away, so I set off hopeful of not only seeing one but maybe hearing it boom too. Ever the optimist! 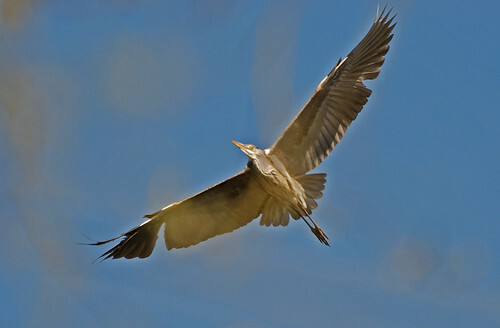 The conservation status of the bittern in the UK is red, meaning it is scarce and under threat. Alas, the chap I was hoping to catch a glimpse of was very scarce indeed, to the point of being completely absent. Oh well, next time maybe. 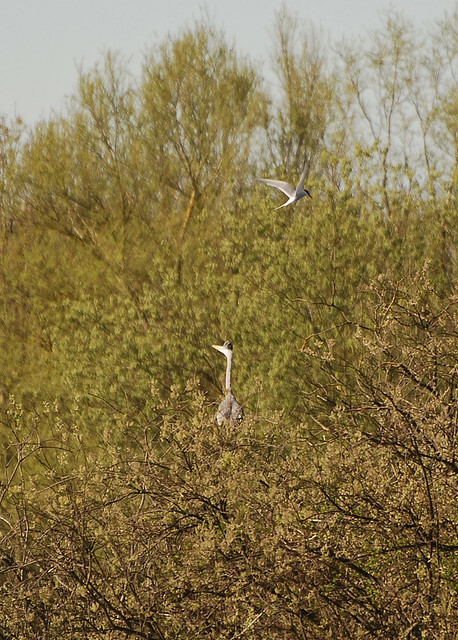 But every cloud and all that, even though the bittern had absconded there was other birdlife in abundance. 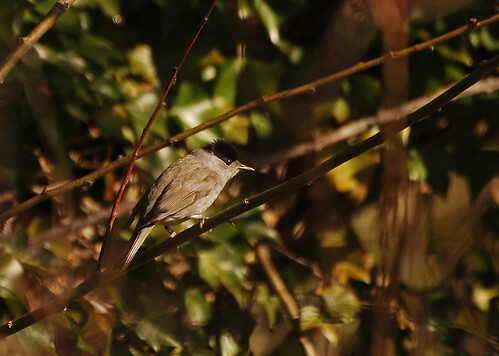 I think this one is a female – the male has a red patch on the back of his neck which I think was absent on this one. 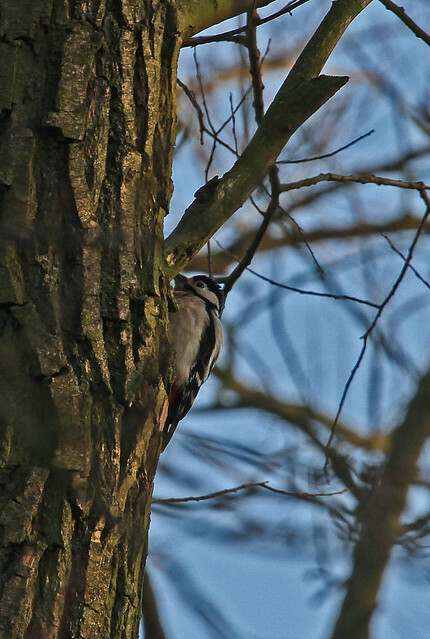 The woodpeckers drumming sound results from the frequency of drilling rather than the power. They have energy absorbing tissues in the head to prevent brain damage and they strike at a frequency of 10-40 times a second which makes the tree trunk resonate, and that’s how they create their unique sound. Treecreepers were spiralling up these trees too, but they were just too quick to get a photograph. 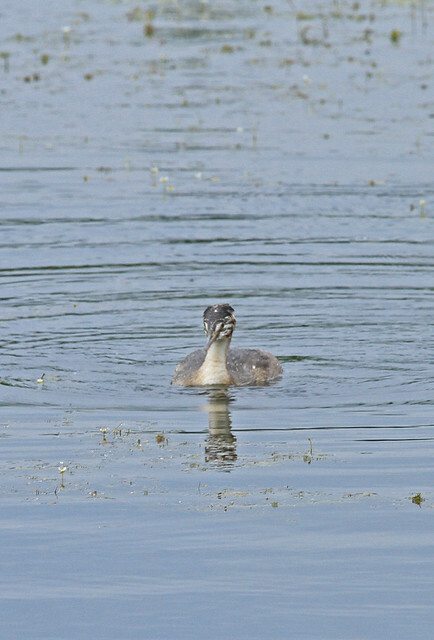 The full mating ritual of the great crested grebe is a wonderful sight. I’ve only ever seen it a couple of times and it involves swimming away from each other to a distance of 20-30m or so, then turning and swimming rapidly towards each other and when they meet they rise up in a vigorous display of necking before settling back into the water facing each other and creating a heart shape with their heads and necks. This is repeated mofre tha once and is utterly absorbing and delightful to watch. 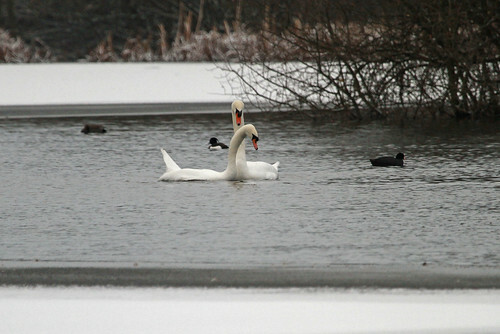 I was fervently hoping that my pair here were going to perform but they were content to simply preen, commune and doze. Still lovely though. 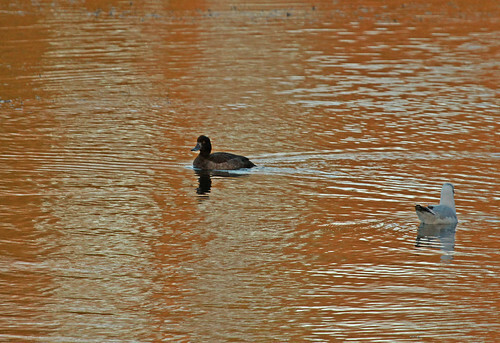 Two male tufted ducks (Aythya fuligula, Dansk: troldand) eyeing a lady with bad intent. 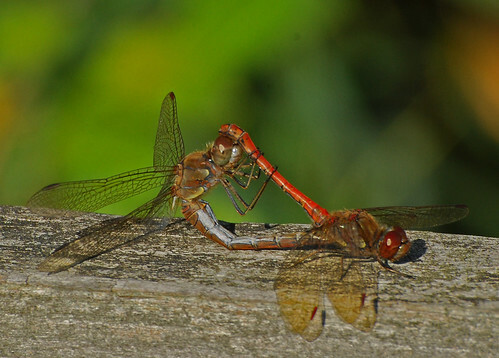 Love, or something, was in the air! 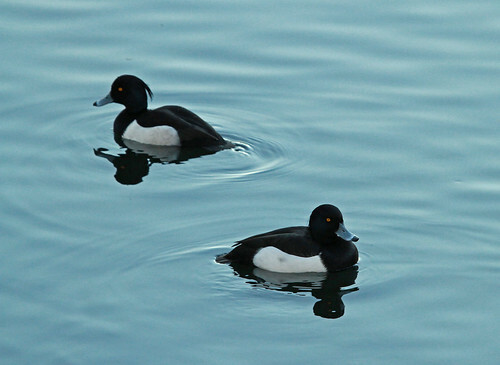 Both pochard and tufted duck are divers and the rapid spread of the tufted duck in the UK in the 19th century is though to be the result of colonisation of UK waterways by the zebra mussel which originates in southern Russia. 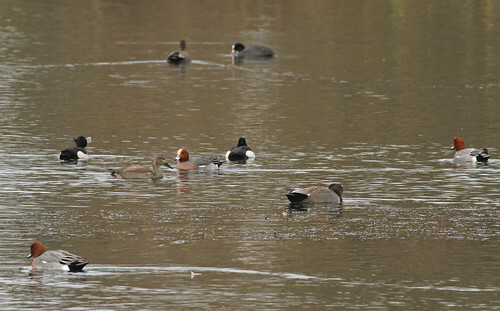 On a grey murky day the gadwall looks like a dull grey/brown duck but when the sun shines on them they are quite handsome birds, easily recognised on the water by the black rump, general brown plumage and the grey/black beak. Coot and moorhen (Fulica atra, Dansk: blishøne and Gallinula chloropus, Dansk: grønbenet rørhøne, respectively) are both members of the family Rallidae along with water rail (which I saw on a previous recent visit to the Country Park, but not this one, even though I spent 10-15 minutes quietly looking where I saw one before) and crakes, which aren’t to be found in these parts. 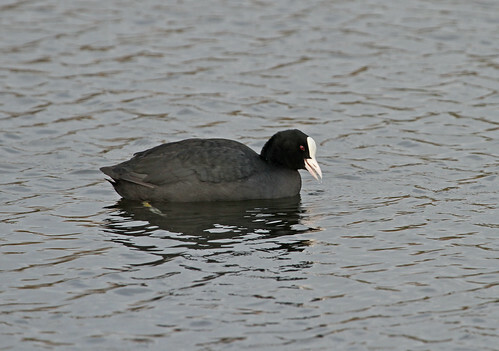 The male coots were in the mood for love and fighting out on the water on all the lakes, and were too numerous to count, and the occasional, more secretive and less aggressive, moorhen ventured into view from the reeds at the lake edges. 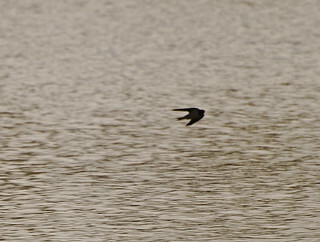 As the sun came up the birds on the water semed to spring into life and large groups of various species busy feeding. All the pictures in this post were taken in a couple of hours or so from dawn until 10-11am and within a 300m radius. But as the sun arose and the light changed the colour of the water changed dramatically and gave some wonderfully varied backgrounds. 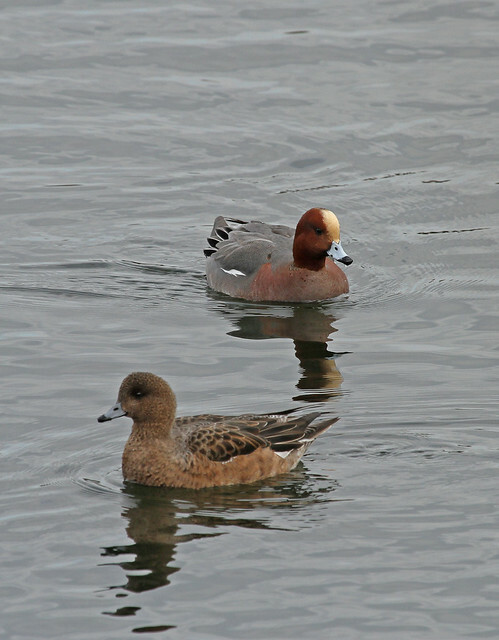 The wigeon is a resident breeder in the UK and it’s conservation status is amber, which surprised me because I see plenty of them on the lakes around Cambridgeshire. 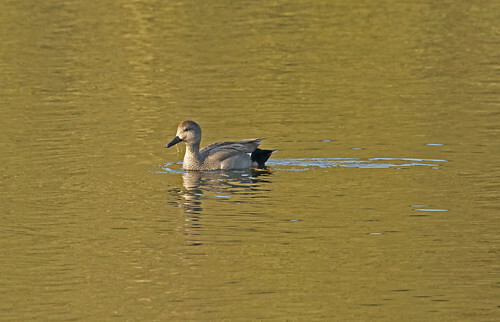 They are vegetarians feeding on leaves and shoots and rhizomes, and in my view they are one of our prettiest ducks. So no bittern on this trip but lots of other wildlife on the water and in the trees! For the last 14 months or so I’ve been saving my spare pennies in order to upgrade my photographic hardware and the plan was to put the money towards the Canon 100-400mm telephoto zoom lens which I mentioned in my last post. (I’ve bought several items in the last 7 or 8 months or so from an online second hand camera shop and I’m going to give these guys a free plug because they have been very good indeed. They are called ‘MPB Photographic‘ and are based in Brighton, UK. I got a cheap Canon 18-55mm lens, a Manfrotto tripod, several filters and the battery grip for my Canon DSLR. All were good prices and the quality has been excellent and exactly as described on the website, so I’ve saved between £5-600 so far! Apparently, the pictures of items on the website are always of the item you are actually buying, not a new one, and the images are zoomable so you can get a good look at it too. So after buying my lens there and it being in mint condition I’ve decided that I’ll buy second hand if they have what I’m after). The good lady wife gave me the lens for Christmas and I was very excited about getting out and about with it between Christmas and New Year, and then on Christmas Day I came down with the lurg and was incapacitated for a week. But on New Years Day I was feeling a little more human, and the sun came out, so I was determined to get to a lake and try to take photographs of distant water birds. I drove the short distance to Milton Country Park on the north side of Cambridge, which was full to overflowing with folk walking off their New Years Eve hangovers. 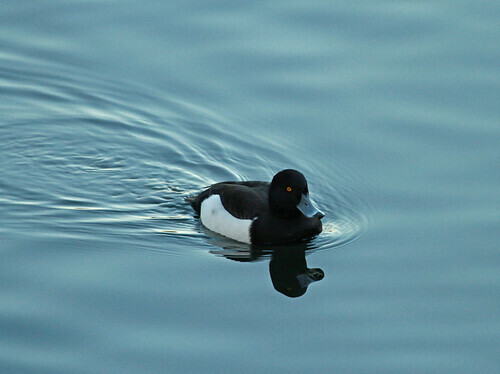 I’ve been on a mission to get a good photograph of a tufted duck because they’re handsome birds and I’ve taken many sub standard pictures which simply don’t cut the mustard, so I was pleased to get these pictures in lighting conditions that were challenging. It was a very cold but sunny day and by the time I got there in the mid afternoon the sun was already behind the trees, so the light was starting to fail and I needed high ISO to get a picture. 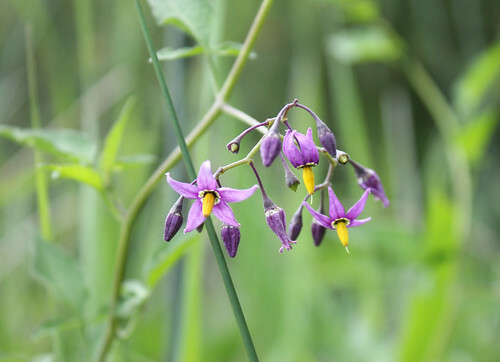 But despite that the quality of the images is pretty good I reckon! 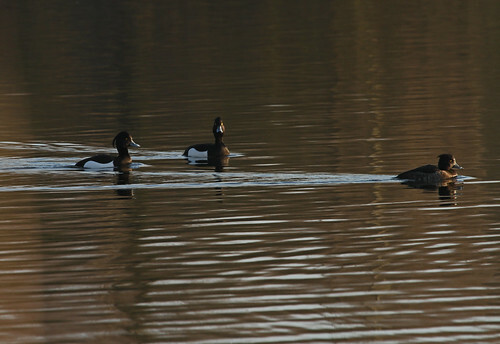 The male tufties were grouped together, there were around half a dozen of them, and a way distant was a female, paddling around on her own and she seemed to be avoiding the males. 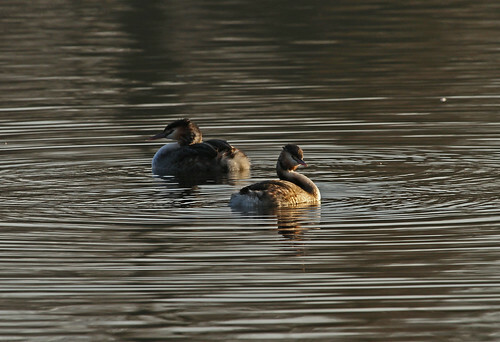 The lady of the species is dark brown on top with mottled brown flanks and is rather less noticeable than the male. Bit I really like this picture of her because of the colour of the water. 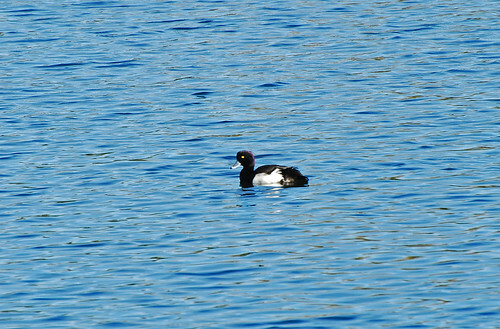 She was 60-70m beyond the group of males in the pictures above and I really liked the difference in the colour of the water due to the sun shining on the trees behind her and reflecting on the water, but where the males were the water was the colour of the reflected sky. So I’m very satisfied with the performance of my new zoom lens and I’ll be posting lots more pictures to show you in the very near future. 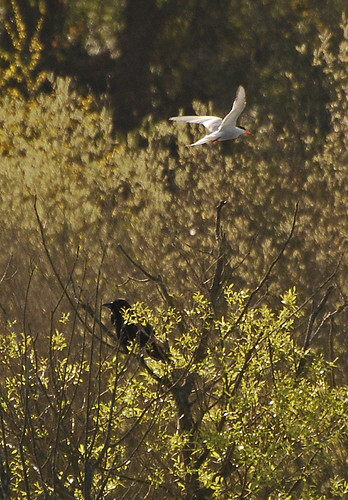 At the same time I was experimenting with ISO and coots at Milton Country Park there were geese in the vicinity too. 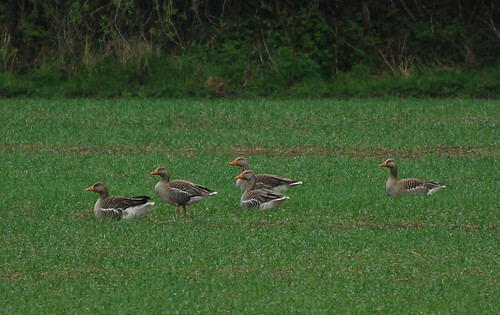 A small flock of greylag geese (Anser anser, Dansk: grågås) were grazing in a field immediately adjacent to the park. There is another flock of greylags I encounter every day on my way to and from work. 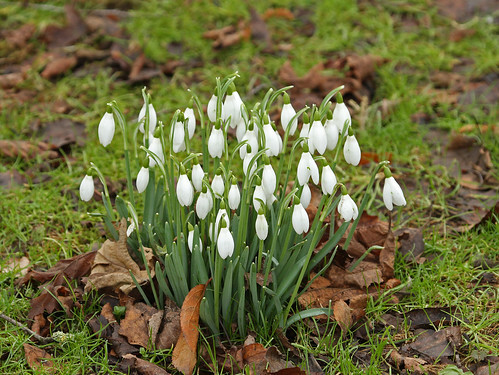 There are around 20-30 that have taken up residence in a field that is on my cycle route. The field is adjacent to a lake and the cycle path passes between them and every morning I pass by there are numerous heads poking up above the crop. I’m surprised the farmer puts up with this because the field now has a number of large threadbare patches as a result of the goose activity. But the geese have been there for a couple of months now and so far he hasn’t shot them so I imagine he probably doesn’t plan to. Which I’m rather pleased about. 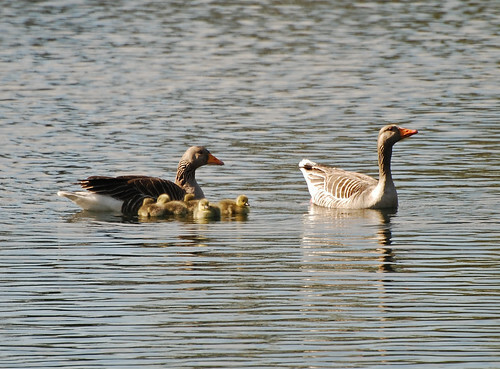 The RSPB website tells us that the greylag is the ancestor of domestic geese and is one of the largest and bulkiest geese native to the UK. It also describes it as ‘uninspiring‘. However, a few weeks ago on my way to work the flock of greylags were spooked and flushed up into the air. 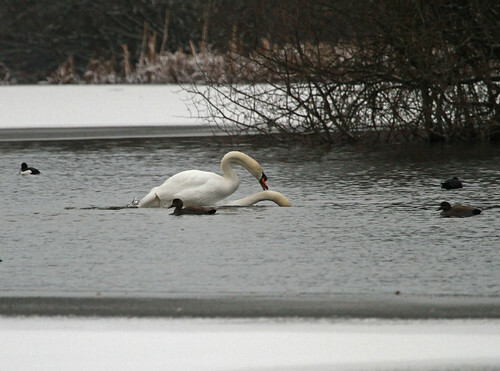 They headed for the safety of the lake which was only around 75m away so they didn’t need to gain height and one of them veered around and was heading straight for me at headheight. We simultaneously computed that if we continued on our current trajectories the end result would be an ugly collision twixt self and goose! 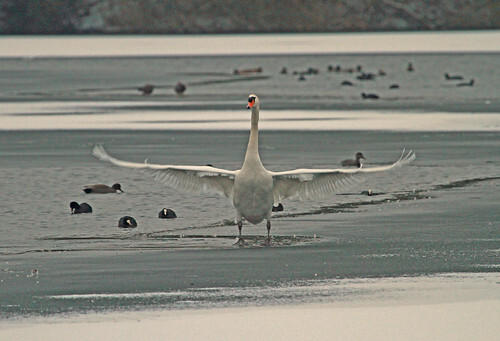 So I braked and the goose wheeled, and it duly arrived at the lake unscathed, passing a few metres in front of me. My adrenaline levels were significantly elevated for the remainder of my journey to work and I can attest to the fact that this particular greylag was indeed very large and very bulky. And anything but uninspiring. 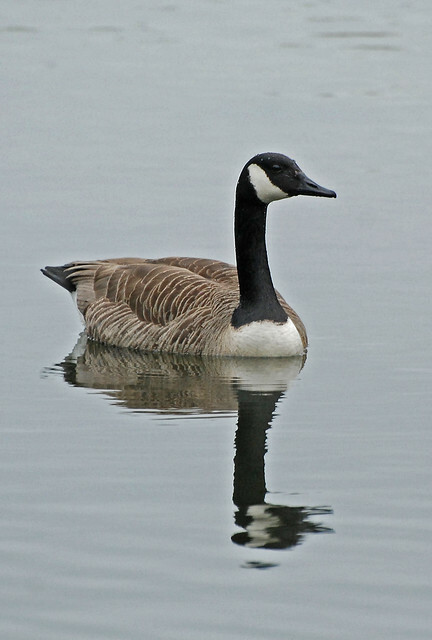 The canada goose (Branta canadensis, Dansk: canadagås) was introduced to the UK and is now a resident breeder here and can be seen all over the UK apart from northern Scotland, and like the greylag it feeds on vegetation. I think it’s a handsome bird. 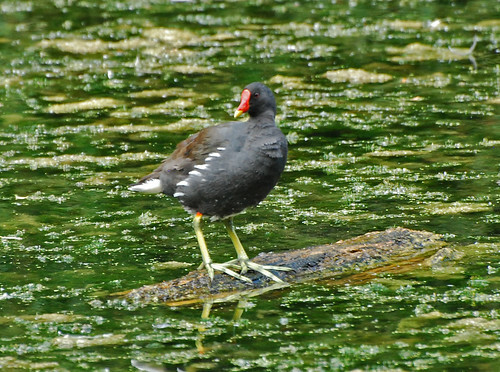 Moorhens are common water birds seen on rivers and lakes, they can be secretive but are often seen out of the water on grassland. 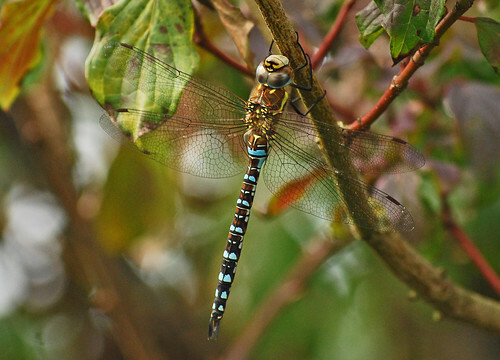 They are resident breeders and winter visitors in the UK with approximately a quarter of a million individuals. 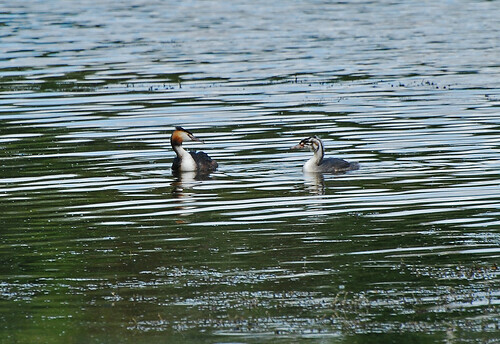 They are omnivores and are one of the few British birds which practice cooperative breeding where youngsters will assist in rearing subsequent broods. 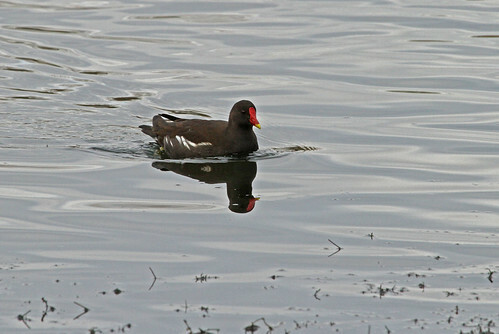 Their red beak and very long yellow legs and toes are distinctive and peculiar to the moorhen. The taxonomic name ‘Gallinula chloropus‘ translates as ‘little green footed hen’. For my international readership, the Danish name is ‘Grønbenet rørhøne‘ – according to the BTO. (If you actually call it something different or have a local name please let me know). 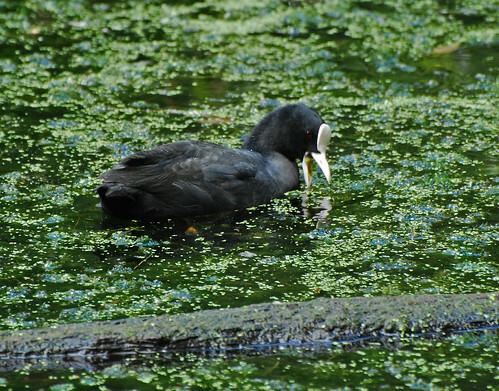 I find coots amusing to watch as they have splendidly bad attitude and defend their patch against all comers, even members of their own species, and will aggressively charge other birds. 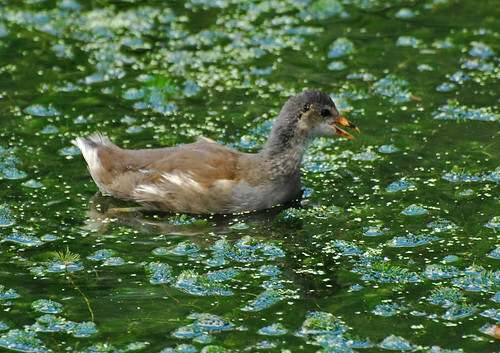 They inhabit the same territories as moorhens and are also resident breeders and winter visitors. 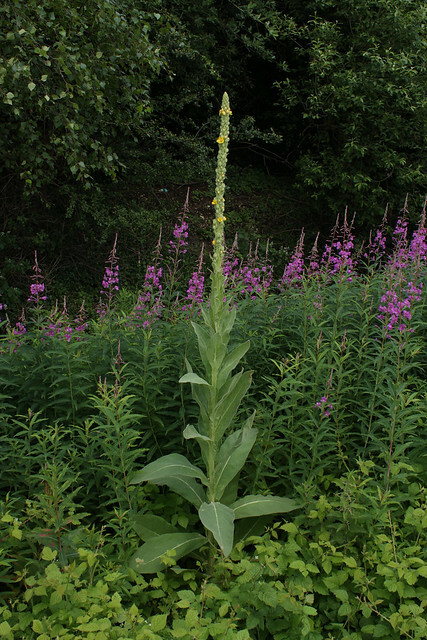 (In Danish – blishøne). 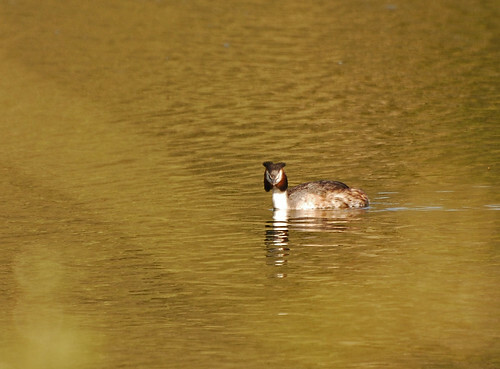 My favourite water bird (apart from the kingfisher, of course) is the great crested grebe (Podiceps cristatus). 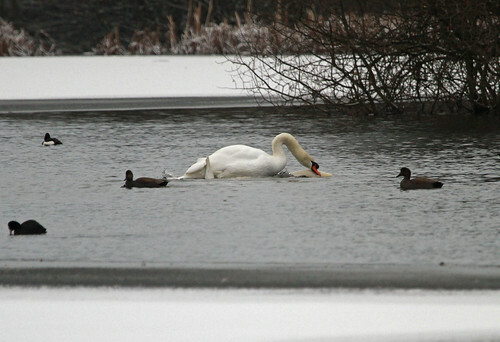 They can regularly be seen on open lakes and have been persecuted in the past because of their dense plumage which was used in place of fur. 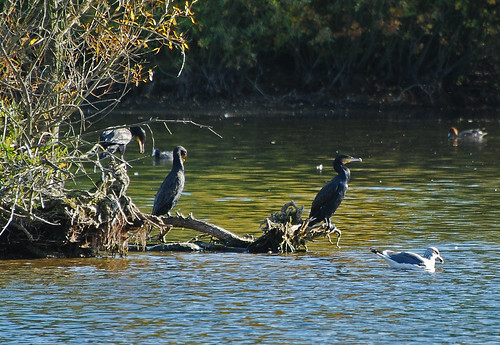 They have distinctive crested head plumage and an amazing courtship display. 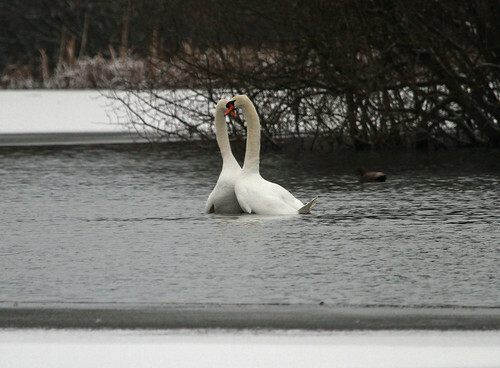 During the foot and mouth crisis in 2001 I watched a pair for a long time performing on a lake in Leicestershire – one of the few pieces of countryside where access wasn’t forbidden at the time. 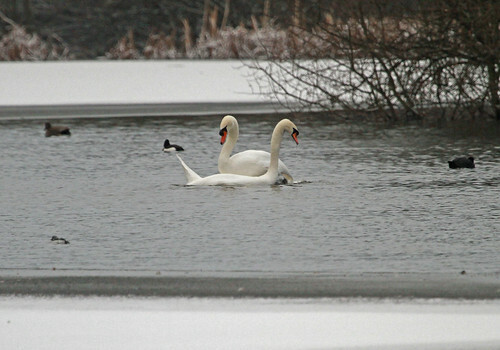 They would swim away from each other in a straight line for 20m or so and then turn and with beaks low on the water swim towards each other at high speed, raising up when they reached each other forming their necks into a heart shape. All terribly romantic! It’s a beautiful display and one of these days I’ll hopefully see it when I’ve got my camera handy. 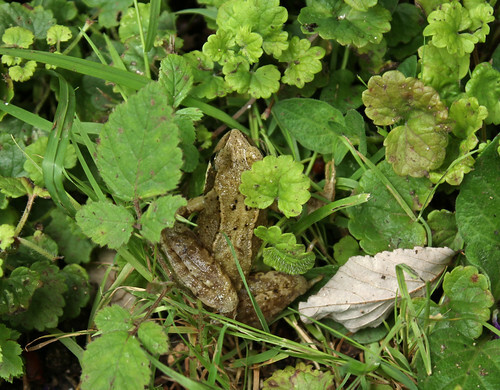 (By the way, in Danish these are ‘toppet lappedykker‘). 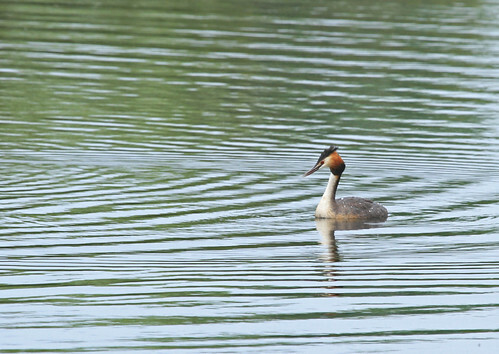 Great crested grebe are also resident breeders and winter visitors but the numbers are much less than moorhen or coot, with 8000 adults here in the summer. 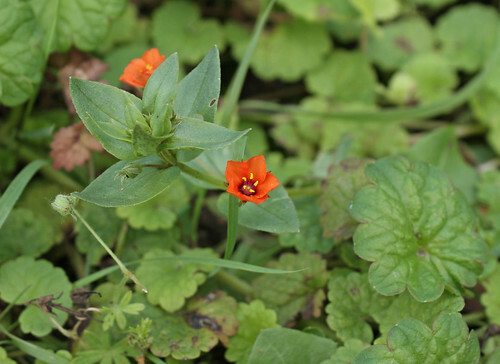 Despite the lesser abundance their conservation status is green.